Well the relentless heat is here. Summer is in full swing and the one thing that will be constant this season is the need for refreshment. What better way to cool down and wash down some great summer food than with the perfect summer wine. Look for wines high in acidity and low alcohol content for a lighter, refreshing wine. 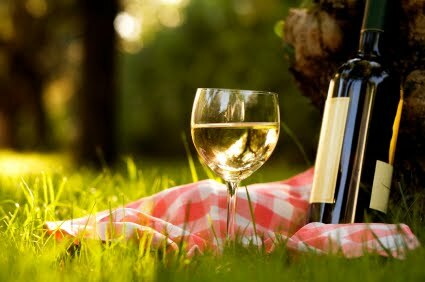 Now we all have unique tastes so here is a brief overview of some varieties of wine that can help make your summer a good one. Traditionally a dry, crisp, flavorful wine, the perfect in between of a white and red wine. The crispiness and lightness of this wine make it very refreshing in hot weather, making this type of wine known as the “summer wine”. It displays fresh fruit flavors such as strawberries and raspberries. This wine is very versatile, the perfect picnic or bbq wine. Goes great with surf and turf, hot dogs and hamburgers, egg salad, chicken, and ham to name a few. Serve chilled. Usually a dry wine, typically light to medium bodied with notable acidity. It is a crisp, refreshing wine that has flavors ranging from herbaceous and mineral tones to a citrus, tropical flavor perfect for the summer! Goes great with appetizers such as veggies and dip, artichoke and spinach dip, Caesar salads, fish, and chicken. A light and fruity wine, with a touch of sparkle and sweetness, well balanced. A perfect dessert wine or aperitif; also goes great with chicken or fish. Ranging from dry to sweet, light to full bodied. This is a crisp, refreshing, and versatile wine with apple, peach, pear and citrus flavors, there is also a hint of honey and spice. Because of the wide range of flavors and versatility, this wine can be paired with almost anything from appetizer to desserts, from chicken, pork, salads, Asian and Mexican foods. A very light, fruity, and easy to drink wine. It has typical aromas of strawberry, berries, and cherries, and is normally served chilled. Goes great with any grilled summer dishes. A lighter colored and flavored red wine, which makes it perfect for red wine lovers to drink in the summer. You could also chill this wine for a more refreshing drink. Its flavors range from cherries, sweet red berries, and plums to an earthy, wood like flavor at times. It is paired great with poultry, pork, ham, and lamb, and pasta. Visit your local Doris Italian Market for a wide selection of these wines. Each location has in store specials for the summer that adds great value to the refreshiment factor of these wines. Ask for assistance in our wine department to find the perfect wine.